This is a revised version of the lectures delivered by Swami Satchidanandendra Saraswati Maharaj during the Sankara-Saptaham celebration at Tarikere in the year 1968. Readers will welcome it as an elucidation of an important subject which has evoked differences of opinion from different interpreters of Sankara. As there was an increasing demand for this enlightening work which is out of stock of Swamiji, of revered memory, we have pleasure in bringing out this edition. Perhaps there is no other point of Sankara’s interpretation of the Upanishads which has given rise to so many differences of opinion from his own followers as well as adverse critics, as the immediate Vision of Atman and its direct means. 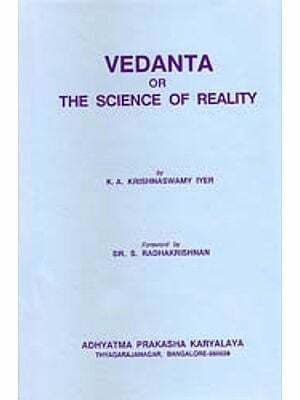 (1) Is the so called vision a sort of immediate realization achieved through meditation and Samadhi or is it the resultant knowledge that dawns directly from the teaching of Vedantic texts about Atman? 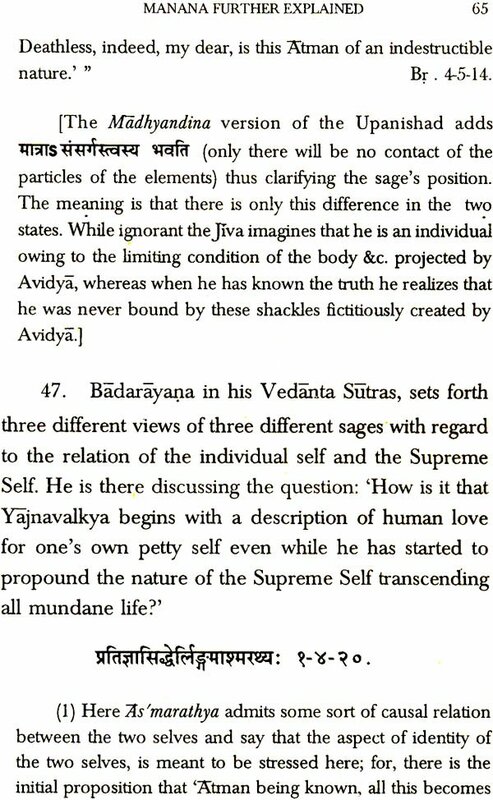 (2) What is Sravana? (3) Is Manana (Vedantic Reasoning) of the same type as reasoning employed in discussions regarding empirical phenomena, or as it something totally different in kind? (4) Why do Sankara and other Advaitic Vedantins repudiate Tarka (ratiocination) and yet indulge in reasoning about Atman themselves? (5) Is Nididhyasanam a sort of meditation (Upasana) on the Atman as taught by the Upanishads or something of a different nature? (6) Does this last means lead to Samadhi (Trance) wherein the true nature of Atman is directly realized, or is the so-called Vision of Atman altogether different from that achieved in Samadhi taught by Patanjali or other Yogi Systems? (7) Are all the three means to be practiced in succession before the vision of Atman is attained, or can any one of them lead to the vision itself ? 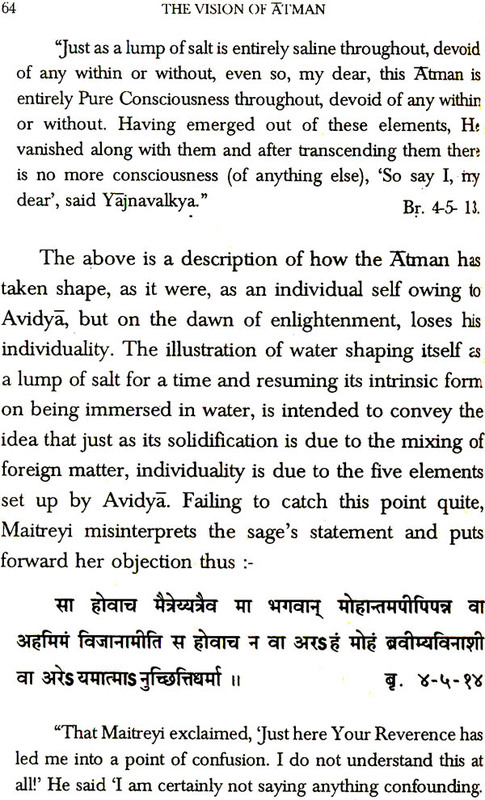 (8) What is M'6ks/me or Immortality to be achieved by this Vision of Atman? Is it an end to be reached in this very life, or is it an eschatological result? These and other questions have puzzled many a scholar who has studied the various interpretations of Sankara. The controversy among, they followers of Sankara cannot be supposed; to ‘have*s1rbsided even today, for the view of Pandits of Vedantic lore depends on the branch of Sankara’s interpretation such as the Vivurana and the Bhamation which each one of them Relies as more authoritative. Such is the subject-matter of the work now presented to the reader. Yet it is not to be discarded as merely of academic interest. For, it concerns the very summum bonum of life to attain which every earnest enquirer into the teachings of Vedanta aspires.